Bordeaux (anc. Burdigala), a city and seaport of France, capital of the department of Gironde, on the left bank of the river Garonne, 58 m. from its mouth, and 307 m. S. W. of Paris; pop. in 1866, 194,241. Long before the Christian era Burdigala was a commercial emporium, and the chief town of the Bituriges Vivisci, a Celtic nation of southern Gaul. In the 2d century Hadrian made it the metropolis of Aquitania Secunda. During the decline and after the fall of the Roman empire it suffered successively at the hands of the Goths, Vandals, Saracens, and Normans. It was annexed to the Frankish kingdom by Clovis, and reconquered from the Saracens by Charles Martel. On the final dissolution of the Carlovingian empire it became the capital of the duchy of Aquitaine. Eleanor of Aquitaine united it to France by her marriage with Louis VII. ; but after her divorce she married Henry Plantage-net, afterward king of England (1154), thus subjecting the duchy to the English crown. From that period until the middle of the 15th century Bordeaux remained in the possession of the English, and in the 14th century the Black Prince made it the seat of his court. The city was the last to submit to Charles VII. of France, in 1453. Since that time the city has been substantially rebuilt, and now is architecturally one of the finest in Europe. In the first revolution it was the headquarters of the Girondists, and suffered much during the reign of terror. Under Napoleon it was injured by the continental blockade, and toward the close of his reign became noted for its loyalty to Louis XVIII. In December, 1870, the delegation of the provisional government of France, consisting of Gambetta, Glais-Bizoin, and Cre-mieux, which during the first months of the siege of Paris had governed the provinces from Tours, established itself at Bordeaux; and on Feb. 12, 1871, the national assembly of the French republic met there, removing to Versailles in March. - Besides the palace or amphitheatre of Gallienus, very few remains of the Roman monuments are to be seen. Those of the middle ages have been better preserved; among these are the cathedral of St. Andre, an imposing though irregular Gothic edifice, consecrated in 1096 and completed in the 15th century; the church of St. Michel, built about the 12th century; the church of Ste. Croix, built before the middle of the 7th century, and restored by Charlemagne; the imperial college, and other ancient buildings. The modern aspect is admirable. 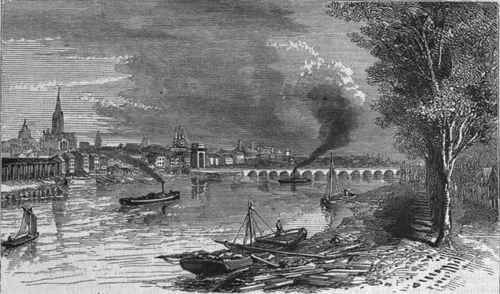 The broad curve of the Garonne is lined with crowded quays, adjacent to which are some of the most commodious warehouses in Europe. The bridge which connects the city with the suburb La Bastide was completed in 1821, at a cost of $1,300,000; it is 1,590 ft. long, with 17 arches. Two of the old gates of the city still remain, la porte du Palais, formerly the entrance to the palace of the dukes of Aquitaine and the seneschals of England, and la porte de l'Hotel de Ville, which is surmounted by three antique turrets. There are numerous open squares, broad avenues, and fine promenades. The place des Quinconces is the finest square in the city, and occupies the site of the ancient chateau Trompette. The public garden in the same neighborhood is elegantly laid out with conservatories, etc. 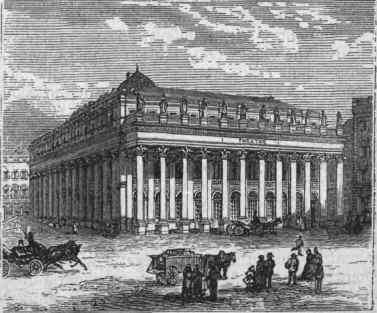 Among the finest of the modern edifices of the city are the Grand theatre, erected in 1780, at a great expense, and presenting one of the handsomest exteriors in Europe; the bourse, in which the merchants congregate daily undef a glass dome covering an inner court 95 ft. long by 65 broad; the palais de justice and the hotel de ville, formerly the palace of the archbishop. There are several fine churches besides the mediaeval ones already mentioned, among them St. Michel, which has a lofty detached tower and contains some fine works of art, and St. Seurin, remarkable for its finely carved porch and curious bass reliefs. There are also a gallery of paintings, a museum containing many historical relics, a museum of natural history, and a public library with 140,000 volumes. The imperial college, academy of arts, sciences, and belles-lettres, and the botanical garden with courses of study and lectures, are among the learned institutions; and there are numerous schools and educational associations. - In commercial importance, wealth, and culture, Bordeaux is excelled by no French city except Paris. The harbor is commodious, and always crowded with shipping from America, Great Britain, and the Mediterranean ports, and the entrance and channel of the river have been greatly improved in recent years. Ship building is very extensively carried on, but the city is not distinguished for general manufactures. There are some iron founderies, cotton factories, and sugar refineries; and brandy, vinegar, cordage, gloves, and musical instruments are made. There is but one bank in the city, and that was transformed in 1848 into a branch of the bank of France. In 1864 1,488 vessels of 356,565 tons entered the port, of which 732 of 142,947 tons were French; and 1,455 vessels of 375,291 tons left it, of which 707 of 167,145 tons were French. The same year 1,644 French coasting vessels of 129,762 tons entered, and 1,745 of 116,714 tons cleared. The red and white wines of the Gironde are exported almost altogether from Bordeaux. The average annual export from 1860 to 1865 was 13,861,976 gallons, of which 5,600,127 went to European ports, 1,822,362 to the United States, and the rest to other countries. The brandies, exported from Bordeaux are produced mainly in the districts of Armagnac and Marmande. The principal distilleries are at Cognac, the best known being those of Martell and Hennessy. The average annual exportation from 1860 to 1864 was 1,598,211 gallons, of which 413,900 gallons went to European ports, 445,329 gallons to the United States, and the rest to other countries.